MASKerade: CTS60 - Happy Birthday to my DMIL! CTS60 - Happy Birthday to my DMIL! I know. Two posts in one day! I actually made this card this afternoon to post on Thursday, but then realized that the current CAS(E) This Sketch challenge will be over by then. And tomorrow is CASology and Wednesday is the new Card Concept challenge, so today was the only day for me to post and link up! This is going to be my mother-in-law's birthday card. This is her favourite colour combination. I quickly arrived at the overlapping Neat&Tangled Happy Birthday stamps, but struggled with how to incorporate the 'ribbon' behind the sentiment/image panel. In the end I embossed a strip of dots with iridescent ep for some more sparkle. But that left me with another dilemma. It's so hard to photograph clear glitter (especially when it's an integral part of the sketch). So that's why this photo is so dark - any lightening I tried made the glitter dots disappear! Love the sparkle of the matt and the circles! I love how you've overlapped the sentiment. I have that set and would never have thought to do that, and it looks fabulous! Beautiful, Ardyth! Your mother-in-law will love this!! Simply gorgeous! Great take on the sketch! Awesome card! Love the silver mat and embossed dots - very sophisticated! 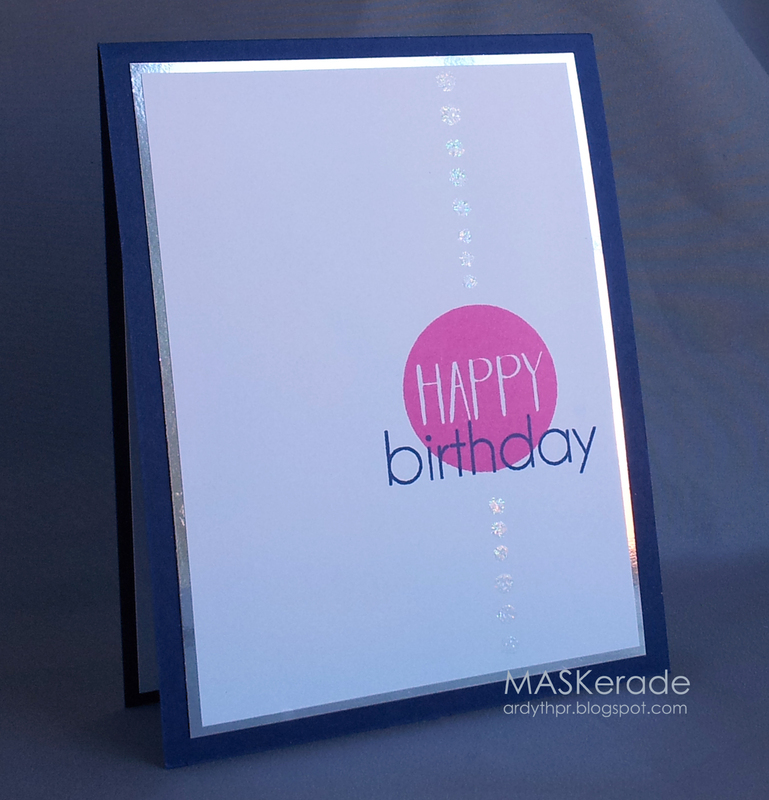 Those glittered dots look so fun with the big circle and blue & white fonts! 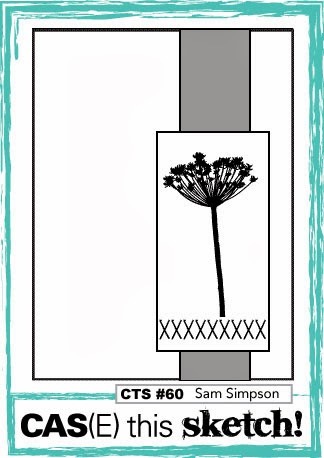 The silver border is so classy and elegant too! A true CAS beauty! Such shimmer and shine. Love it! what a beautiful card and I love the shiny stars and the silver paper border, really makes your card "shine". Beautiful Ardyth - the glitter dots just make it! Yes photography is always tricky Ardyth, I love this card. So clean and the results are gorgeous for your Mother-in-law! The overlapped sentiment....wow! The bit of sparkle looks so pretty with the pink. Good idea to darken the photo to capture the the iridescent ep. #1 on my list when I win the lottery is to hire a photographer just for my cards! I waste so much time trying to get the a good photo!!! Fabulous design. I love that iridescent column of dots, and I can see the sparkle all the way out here in California. Awesome CAS card Ardyth! Love the shimmer. Way to rock the sketch with the touch of glitter! Love this, Ardyth, and I'm sure your MIL will, too! Gorgeous and classy! Love the sparkle and shine and the overlapped sentiment. Thanks for playing along with CAS(E) This Sketch this week!